She’s getting tall enough to ride her tricycle, but her legs are just a tad too short to reach the pedal at its furthest point. She can now turn the pedals several turns but if she doesn’t give enough push on the downward stroke the pedal doesn’t get all the way around. And she doesn’t quite have the hang of turning the wheel to steer yet. 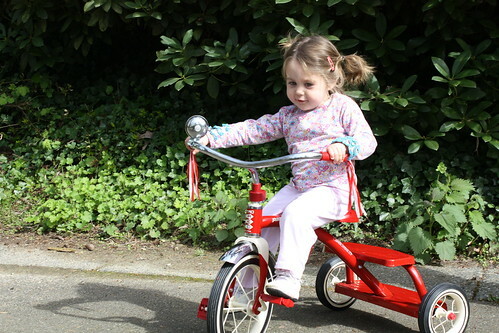 She sings a song that goes “Pedals and wheels, pedals and wheels” as she rides it. I don’t know if that’s a made-up song or something she heard somewhere.